Pittsburgh — The GOP is off the air in Pennsylvania and polls show President Barack Obama leading Mitt Romney by a comfortable margin, but PA Republicans Wednesday insisted that the state is still in play. “I’m certain Pennsylvania is going to play a pivotal role in the election this year,” said Governor Tom Corbett. He spoke with reporters during a conference call Wednesday. He said that the absence of television ads isn’t conclusive evidence that the campaign has given up on Pa. Likewise, Senator Pat Toomey said that public polling could be misleading. “My experience back in 2010 was that polls that were reported on in the press very frequently diverged enormously from the polls we were running internally and the kind of numbers that I had confidence in,” Toomey said, citing differences in methodology and other variables. 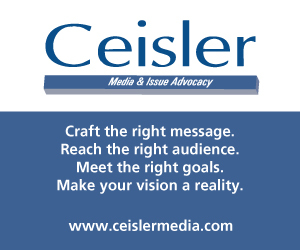 It’s a tough case to sell, as both men had a healthy television presence and lead in the polls at this point in the cycle during their successful campaigns in 2010. After all, the people who decide where to spend money on television ads have no shortage of internal polling. Neither the Romney campaign nor any major Republican PAC or super PAC is currently on the air in Pennsylvania. Following suit, Democratic groups have also pulled out. According to the Real Clear Politics average of Pa. polls, Obama leads Romney by 7.7 percent, 49 percent to 41.3. Instead of TV, Republicans recently have emphasized their program to mobilize supporters in recent days in the hopes that national campaign developments will put Pa. in more serious play closer to election day. The Romney campaign named its area leaders across the state on Wednesday, including three men at a Pittsburgh press conference who insisted that the GOP is focused on getting out the vote. 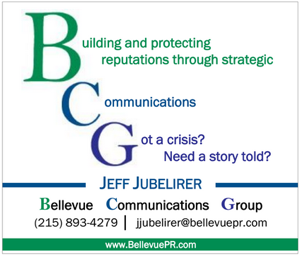 A campaign spokesman said that the campaign, in conjunction with the PA Republican Party and the Republican National Committee, has 65 paid staffers on the ground in Pa. spread among 25 offices. 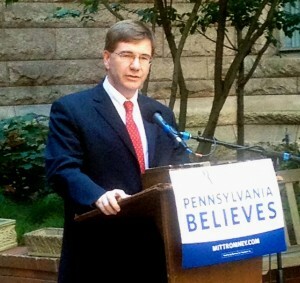 12th district congressional candidate Keith Rothfus blasted Obama at the press event, saying, “the President has never in four years, pivoted to jobs.” He reiterated that the Mitt Romney and Paul Ryan ticket would produce jobs for Pennsylvanians and Americans alike. Rothfus faces Rep. Mark Critz in a district where presidential year turnout is likely to boost the GOP. He echoed the sentiment that grassroots energy would carry the party to a win. He stood behind a Romney campaign placard that said, “Pennsylvania Believes.” Time will tell how much the campaign believes in Pennsylvania. The Romney folks are missing a wide open opportunity to put Pa back in play. Congressman Meehan and his coup with Unions and some folks in surrounding cities and suburbs of SEPA who have candidates on the line already know how to get the “Swing” back Pa. All the Boston folks need to do is follow the lead of their ground troops in Victory Pa. and some real SEPA wunderkinds (DeFelice) and they might have a real fight to win Pa…..
Is Keith the Candidate going to condemn Mitt Romney for enflaming tension in the Middle East and politicizing American Security and Foreign Policy? There are many Americans in Harms Way! We can do better than this Mr. Rothfus! I know you need to check in with Rev. Robertson for permission! All that money the Romney campaign has and they just give up on Pennsylvania? How many ads do you really need to run in Iowa? All that hard work suppressing Democratic votes down the drain. Do the R’s arguing against the polls undertsand it is Romney who has decided PA is lost?